One of the trickiest things to get right when setting up your auction is fair market value. Ok, so lets make the lawyers happy first with a little disclaimer! Before we discuss tax deductions, fair market value and IRS guidelines, I wanted to state a disclaimer that this blog is not meant to communicate any tax advice. Everyone should consult with a tax advisor regarding their specific auction, organization, donors and bidders. Fair Market Value (FMV) isn’t just an indicator of how much an item should bring in the auction, it is also important for tax reporting. However, we find that there is a lot of misperceptions about how tax deductions work in charity auction and fair market value is at the center of the confusion. The donor is typically able to claim a deduction that is based on the value of the item donated. The amount and nature of that deduction is subject to some complicated IRS rules. 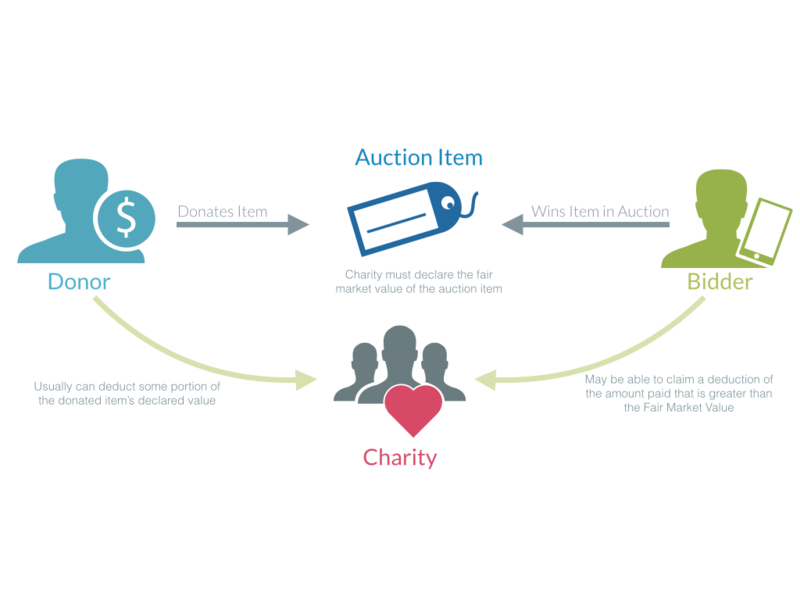 The charity puts the item up for auction and declares a fair market value (FMV) of the item. The FMV of the item is typically provided by the donor, but not in all cases. The bidder wins the item and pays for it. This transaction is called a “quid pro quo” transaction and thus their tax deduction is limited to the amount they paid that is greater than the fair market value. So what happens when you incorrectly set the fair market value of an item? You could be impacting your winning bidder’s ability to claim an accurate deduction. Your donors should advise you of the fair market value of the item. In cases where the item is made, we often recommend setting the FMV to the cost of the materials. For example if the item is a painting made by a class at school, the fair market value should be the cost of the paint, the canvas and frame. While priceless may be a tactic to attract bids, it is not an appropriate value on an item. In fact, Handbid does NOT allow you to set a value at priceless. Setting the FMV too high (including priceless) may reduce or even eliminate the deduction your winning bidders can claim.